When folks get tired that Porsche wont build the GT4RS that we all want, they send it to us! This car just showed up from Vegas with an existing list of rather awesome bolt-ons in the form of power mods, suspension mods and aesthetics that you would expect on a car worthy of being called an RS. Inside it has a 4-point harness bar, factory carbon fiber buckets and leather stitched floor mats in addition to a bunch of other cool unique upgrades; on the outside it has the rear diffuser, taller rear wing uprights, carbon fiber Vorsteiner rockers, a larger carbon fiber front slippter, RS style vented front fenders and carbon fiber front dive planes. Everything on it is worthy of the RS designation EXCEPT for the gears and the power plant but that's about to change. We are even going to add the front axle lift kit so the owner we can run the ride height I want on the track without leaving the chin spoiler in the driveway when the customer returns from harassing GT3s! We will document the build here with the before and after dyno runs and any of the additional install work you guys are curious to see! P.S. 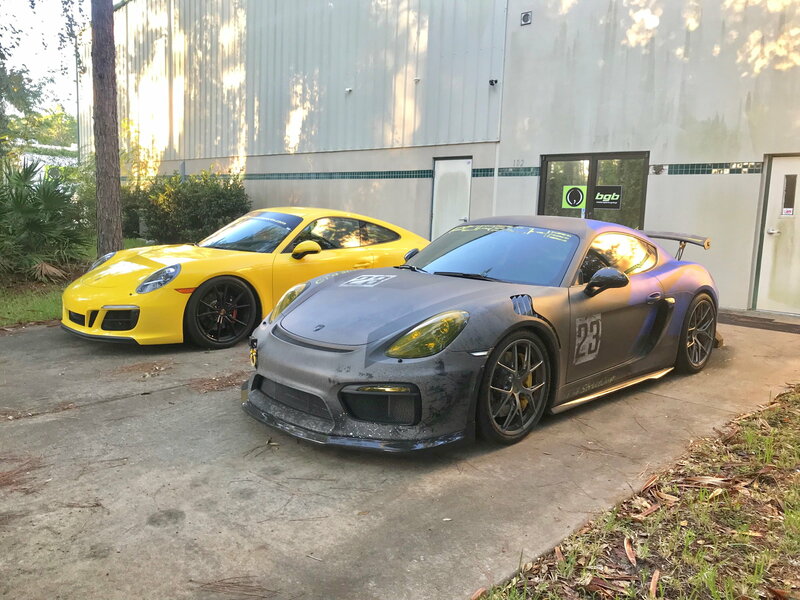 The 991.2 GTS shown on the left is for sale if anyone is looking for a perfect track car with over $50K in upgrades and less than :30 minutes running time on track! Finder's fee / labor credit to anyone that finds a home for this thing! Very cool....looking forward to watching the evolution of your project. Thank you! I plan to post lots of pics to keep folks interested. YES! Don't worry...I will be pushing the content hard to keep folks interested! Sweet, thanks so much! Looking forward to seeing the dyno results of the updates and I hope they have time to dyno with both the GT3 exhaust and the GT4 Akrapovic exhaust to see the difference. It looked like there was at least 10-15hp in the 4l X51 being held back by the stock PSE. Also very much looking forward to hearing how the gearing changes come out on this build, we were talking gearing changes yesterday and I was thinking it would be an awesome winter project. We'll try to dig up my old bone stock original baseline dyno to plot against the latest tuned 4l X51 and share with RL! Delete. Not relevant to this thread. Last edited by RaceDevelopementCenter; 10-31-2018 at 05:12 PM. would have thought this was a horrible idea but they look GREAT!